As we all know, blue cruise holidays can be a wonderful experience in the Turkish Riviera. Private and custom tailored for your requirements, gulet cruises are a great way to get your family and friends together for a traditional, cultural, historical and healthy journey in the Mediterranean and Aegean sea regions. As a pleasant addition to your already wonderful holiday style is bike tours in Turkey. Having that change of scenery can offer you the opportunity to see more of land than you normally would in a standard gulet charter itinerary. The best times for such hybrid holidays are when both the waters are at the right temperatures, and the weather is not too hot. These months can be late April, May, June, September, and October. 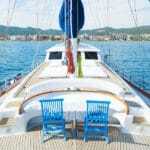 With private gulet cruises, the boat is yours and not shared with any other passengers. The crew caters only to you and your group – around the clock. The same applies to the bike tour you can add onto your one week holiday. Choices for bike trips can be anywhere from 2 to 5 days, combined with your Turkish gulet holidays route. 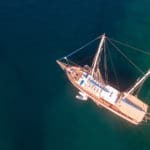 Since the boat is at your disposal, when you switch over to the bike tour, the gulet either follow you to your next stop or waits for you in the bay until your return. The whole concept is flexible and made-to-order. Why not add a bit of change to your already splendid gulet cruise holidays with a few or more days of biking trip along the Carian coast. 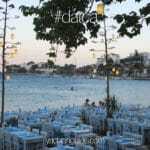 Trips can start in Marmaris or Bodrum. Don’t forget, everything is private about the holiday and designed just for you. The cost? That too is up to you. You can choose a gulet that is available for the period in which you wish to travel, your route, and then a bike tour will easily be integrated into a complete holiday package. 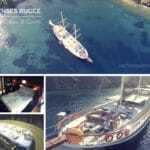 If you’re not keen to do a private gulet charter, then join our Cycle Gulet Cabin Charter Cruises instead!